I’ve tried a few Thai places in the Chelsea area but they can be hit or miss. For example, my previous go to Thai restaurant was Spice. It has been inconsistent in both quality, presentation, and taste. I’ve walked by M-Thai quite a few times and it almost always has a fair share of people in it. So, the other night I decided to give their delivery a shot. The food arrived in approximately a half hour, if that. Well done tiny delivery man. Well done. We stuck with our usual orders. Both because we are creatures of habit and because it’s delicious. We started with the fried “dancing” calamari with a spicy Thai chili sauce. 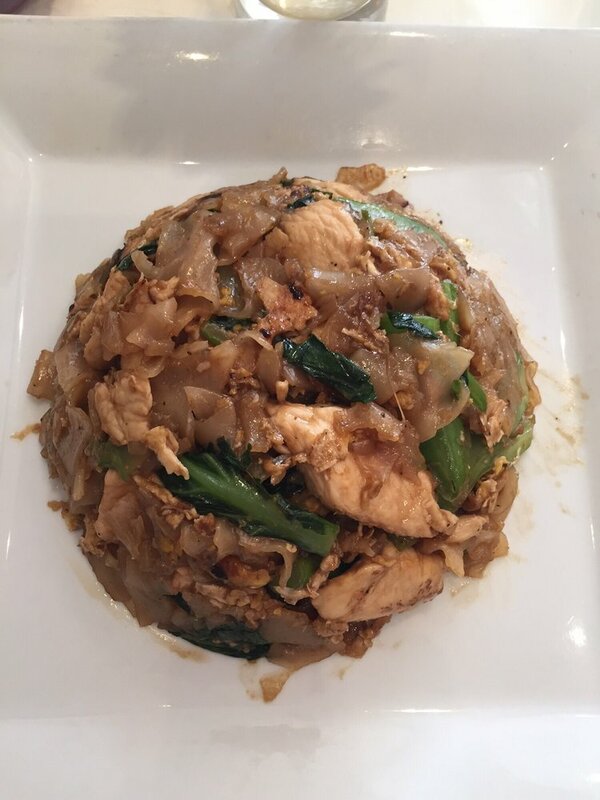 We also split an order of chicken Pad Thai and chicken Pad See Ew (named Rice Noodles here). After tax and tip it came to about $36. The fried “dancing” calamari did not dance. This was disappointing. The cook was perfect. The squid was crispy and had the right amount of tenderness, not chewiness, to it. The spicy chili sauce that comes with it was tasty but far from spicy. I had written down that it was “sweet” before looking at the menu to find the proper name for it. The Pad Thai was on the sweeter side. This is far from a complaint in my book though I know some people may be turned off by it. I would have enjoyed a slightly better chicken-to-noodle ratio but I was satisfied nonetheless. Don’t mistake me, I demolished that Pad Thai. Which is why all the pictures in this post are taken from Yelp.. It had the perfect amount of ground peanuts and bean sprouts. I HATE too many peanuts, but I love me some bean sprouts. The Pad See Ew wasn’t my favorite at first. It was not bad by any means but I felt that it could use a bit more flavor too it. The noodles were a tad under cooked in my opinion. It was decent but could use a little pick me up. Like jazz hands or cocaine. I preferred the Pad Thai to the Pad See Ew but my partner was the of the opposite mindset. We had some Pad See Ew left overs and I have to say I enjoyed it significantly more the day after. I was happy with the price point and the portion sizes. To compare, both noodle dishes would be smaller portions and cost $12 at Spice vs. $8.98 here. Lunch specials start at only $7.98 and include a small appetizer as well. Considering price point, speed of delivery, portion size and food quality I will be revisiting M-Thai. I think I found my new go to Thai place in the area. As long as the quality stays consistent anyway. 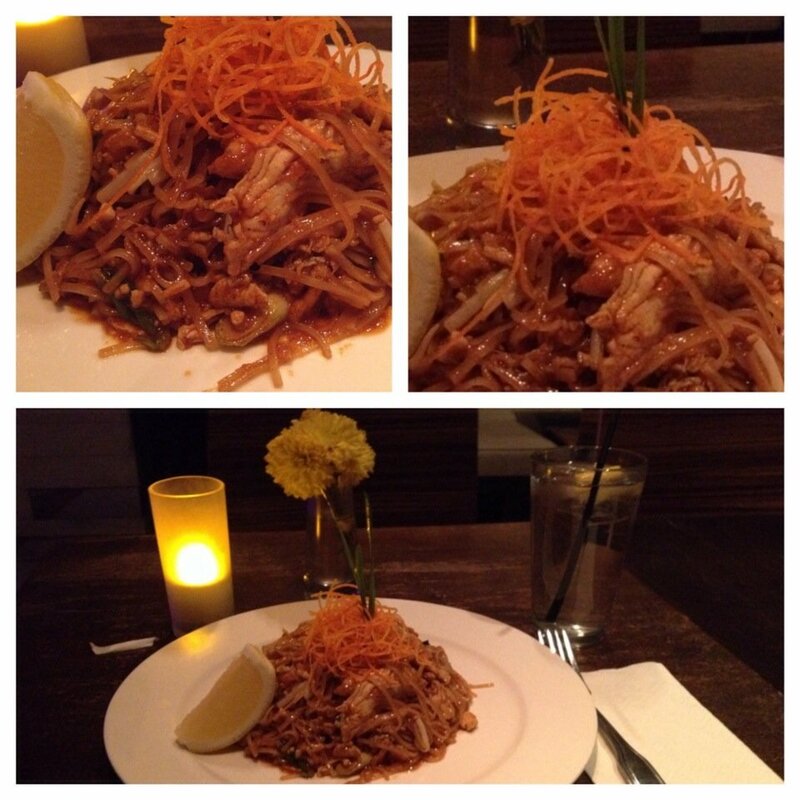 If you’re craving Thai food and in the Chelsea area, M-Thai is worthy of your attention. Enjoying your visit? Please SUBSCRIBE to receive e-mail notifications of new posts! Enjoying your visit? Please SUBSCRIBE for e-mail notifications of new posts!